“Heartworm” is a term that most dog owners hope never to hear their veterinarians say. Unfortunately, heartworm diagnoses are all too common. If left undetected and untreated, these worm-like parasites—which live inside the hearts of dogs and cats—can cause shortness of breath, increased fatigue, and eventually heart failure. Unfortunately, the way in which heartworm is transmitted is almost completely unavoidable. Dogs in every state have been diagnosed with heartworm disease. Mosquitoes are one form of transmission, carrying heartworm larvae from dog to dog between bites. You might be in luck depending on where you live and on the weather. If you live in a state where winter-month temperatures reach below freezing (and mosquitoes die out), you may want to ask your vet about whether your dog needs to be treated for heartworm every month. If you live in a warmer state, then your vet will probably want to follow the American Heartworm Society’s recommendations and have your dog treated monthly. Because heartworm is impossible to prevent completely, and sometimes treatments aren’t effective, the best approach to combating heartworm is to prevent an infection in the first place. Heartworm preventatives come in a variety of forms, including treats and small pills. These treatments can be light on your wallet, too. 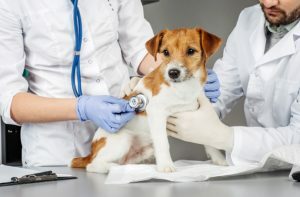 If your dog does become infected, treatments can become very costly and time-consuming, requiring multiple appointments and restricted playtime for your pup. Without taking the proper steps, you might be seeing your vet more than you or your dog would like to. If your dog seems fatigued, less excited about exercise, and unable to shake a mild cough, it may already be too late. Schedule an appointment with your veterinarian today if your favorite pooch isn’t currently on a prevention medication or if you think she might be infected.